Floreana Island has the odd distinction of being a major stop for most cruise tours in the Galapagos Islands – yet very few travelers stay there. Galapagos Travel Planner will give you the inside scoop on how to spend a few days exploring the island’s many mysteries. From the main town, Puerto Velasco Ibarra on Black Beach, a number of the island’s sites may be visited. Some require an official guide. All are open daily 6a.m. – 6p.m. Just outside Puerto Velasco Ibarra is La Lobería beach, home to sea lions, marine iguanas and sea turtles. You can also snorkel and kayak here. Eight kilometers (five miles) from Puerto Velasco Ibarra is Asilo de la Paz, the cave where pirate, Patrick Watkins, and the German settlers lived. Nearby is the island’s only source of fresh water. Not too far away is Las Palmas, Dr. Ritter and Dora Strauch’s homestead, and Ritter’s grave. Cerro Alieri hill, located 5.3 kilometers (3.5 miles) from the port, has many plants endemic to Floreana. Other attractions are best accessed by boat, including Post Office Bay on the north shore of Floreana. At Punta Cormorant you can see flamingos, manta rays and rare plant species, and Mirador de la Baronesa, between Post Office Bay and Punta Cormorant, was the Baroness’ favorite place to hang out. Around Floreana are several scuba diving and snorkeling sites: Corona del Diablo, Isla Caldwell, and the islets Champion, Enderby, Gardner and Watson. Hammerhead sharks, sea lions and schools of manta rays are some of the marine fauna you can observe. 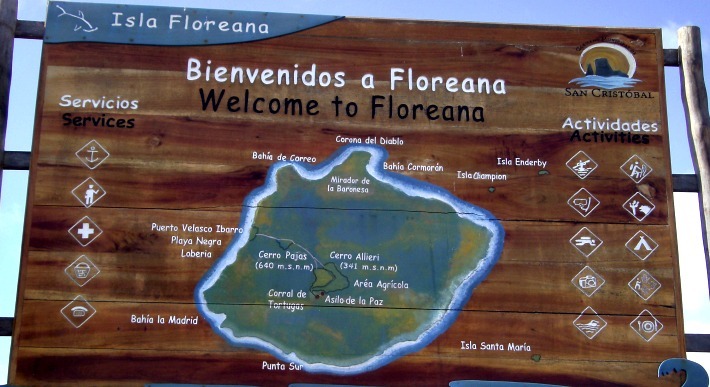 Most people go to Floreana on an organized tour, either on a multi-day cruise or on a day trip from Santa Cruz Island. If you are doing the Galapagos independently and have a few days to embark on an adventure, then go on your own. Local transportation departs from the pier in Puerto Ayora, Santa Cruz Island ($30 one way, up to $40 from a travel agent). Boats leave several times a week – but only when there are enough passengers. You will need to go through a customs search to ensure you won’t also be transporting anything that could affect Floreana’s ecosystem. Floreana has several lodging options in Puerto Velazco Ibarra. The best appointed are Hotel Wittmer and Floreana Lava Lodge. Other options are Hospedaje Nayip, Hospedaje El Pajas, Black Beach House and Lecocarpus. Also, families rent rooms in their homes. Four restaurants operate on Floreana: Lelia’s Restaurante, El Oasisde la Baronesa, Devil’s Crown and La Canchalagua. There are also small shops, though selection will be limited. Be sure to bring plenty of cash from Santa Cruz Island, as there are no ATMs on Floreana. Stay on the marked paths. Bushwhacking is a dangerous pursuit due to the rugged lava terrain and lack of shade and water. So get off the beaten Galapagos tourist track. Who knows – you might just solve one of the Islands’ most enduring mysteries!